RAYNET is the UK’s national voluntary communications service provided for the community by licensed radio amateurs. 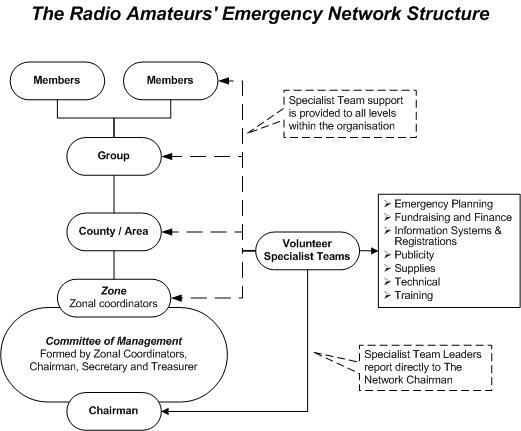 The organisation was formed in 1953 following the East Coast floods, when radio amateurs provided emergency communications. We can provide a flexible communications service for major civil emergencies or related exercises and local community events. RAYNET volunteers normally use their own equipment to provide communications. Voice transmissions are the norm, but messages in the form of data transmissions are being increasingly used. In some areas, the use of vehicle-tracking systems and MESH networking can also be provided. Whom do we do it for? Any UK Police force, Fire & Rescue service or Ambulance trust. RAYNET comprises a national network of local groups, who liaise with emergency services, local authorities and other voluntary agencies who could be involved in the integrated management response to major civil emergencies. Groups are supported by a County/Regional, Zonal and National structure. All registered members of RAYNET-UK whilst on duty are covered by "Public Liability" & "Employers Liability" insurance, together with Personal Accident Insurance under policies held nationally. Groups work with the emergency services and local authority emergency planning units on both live exercises and table-top simulations. It is, of course, important to have “hands on” experience regularly and throughout the year and to carry out training to nationally agreed standards. RAYNET personnel provide additional safety communications for local fun runs, marathons, car rallies and a wide variety of events, whereby message passing, engineering skills and operational procedures can be tried and tested. In times of major civil emergency, existing communications can become rapidly overloaded. Full contact details can be found on this page. A company limited by guarantee, registered in England and Wales company number 2771954. Registered office 9 Conigre, CHINNOR, Oxfordshire OX39 4JY. Charity registered in England and Wales number 1047725 and in Scotland number SC046184.